The perfect Valentine for a sweetheart, child, BFF, or teacher! Hugs, Kisses, and Valentine wishes, complete with Lip Smackers lip balm. Concord & 9th Challenge #23 Mixed Media. I used real latex and mylar to create “real” balloons for this card using the Happy Balloons Bundle from Concord & 9th. Other products include Altenew and Stampin Up! Tagged: altenew, concord & 9th, Stampin' Up! This project is inspired by the Altenew Inspiration Challenge and uses the Peony Bouquet stamp and die set, Altenew layering inks, Simon Says Stamp die-cut banners, and Nuvo gilding flakes. I used a well-used dryer sheet to add soft texture and give a "fabric" look to the floral focal image. This handmade card is for the My Favorite Things MTFWSC367 challenge. I used some of "my favorite" products such as the Blueprints 5 Die-namics and Stitched Sentiments Strips Die-Namics. It's a fun "just because" gift card holder. I love My Favorite Things Die-namics and they cut perfectly with their heavy card stock. This handmade shaker card is for the MTFWSC367 Sketch Challenge. I paired some of "my favorite" My Favorite Things products with a shaker element from the Papertrey Ink Shakers + Sprinkles kit. Here is a quick and simple handmade thank you card using washi paper for a patterned paper look. This is a card for the My Favorite Things MTFWSC367 Sketch Challenge using one of my favorite MTF products, the Stitched Sentiment Strips. I hope you check it out! I am loving the Altenew Snapshots Stamp and Die Set and was excited to get to use it for the Altenew Sketch Challenge #7. I added a couple sentiments from Paper Smooches, Concord & 9th, and Butterfly Reflections stamp sets as well. I hope you get some ideas for your own projects! Stretch your Stampin Up! July 2017 Paper Pumpkin supplies with these alternative designs. One of my favorite Paper Pumpkins, the Positively Picturesque kit was a favorite and is on sale now! I combined a couple die cuts (banner and bow) from the Concord and 9th Love Notes Envelope Dies with this adorable Happiest of Holidays stamp set from Winnie and Walter. I stamped the bird home in Memento Tuxedo Black Ink because I had planned to color it with Copics. I ended up coloring it with a combination of Prisma colored pencils and a little extra blending with a Zig marker. I originally colored the cardinal with colored pencils as well and fussy cut it out. I added Nuovo crystal drops to the bird and the color bled so I ended up using one that I had colored with Copics and originally decided not to use. It coated with Nuovo drops much better and I love how he turned out! I used the Concord & 9th Perfectly Penned letters to stamp the Home in Versamark ink then heat embossed it with Stampin up! copper embossing powder. The "for the holidays" and holly are from the Winnie and Walter stamp set. 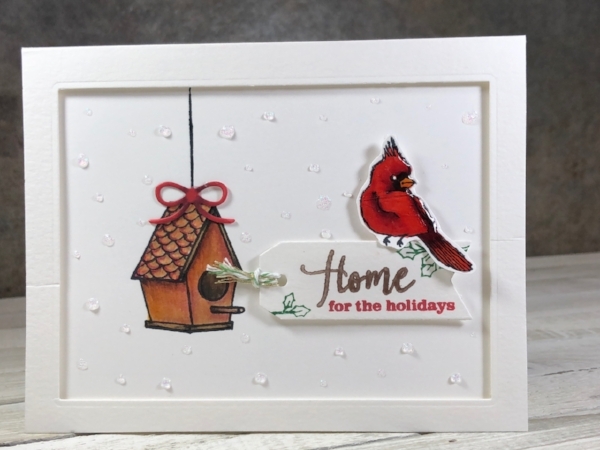 The window for the card frame was die cut from watercolor stock to give it a little more texture and thickness from the Neenah stock I stamped the birdhouse on. I added some snow with Nuovo drops and foam mounted it to the card base / frame. Thanks so much for checking out my project for these two challenges! These sending hugs and selfie photo handmade cards are inspired by My Favorite Things Sketch 357 Challenge. Products used include My Favorite Things, Echo Park, We R Memory Keepers, and Paper Studios.